Most conventional anti mosquito repellents include chemical ingredients that may affect health. Nowadays, researchers develop a natural way of bite prevention currently based on applications of essential oils extracted from plants for mosquito control. These extracts should demonstrate promising insect repellent activity. Thus, they could be developed commercially as an effective personal protection measure against mosquito bites and to control saliva-borne diseases. Active ingredients from oils to repel mosquitoes have shown promise for further development into formulations. In addition, these bio-deterrents may serve as alternatives to DEET, pyrethroids, dialkyl phthalates and PMD synthetic mosquito repellents. Numerous plants with insect repelling properties are native to the mosquito-affected regions. In most countries, some native plant species have a history of use for personal protection against blood-sucking insects. In fact, plants for mosquito control contain such active ingredients as geraniol, OLE (oil of lemon eucalyptus), limonene, pyrethrin, citronellol, citronellal, vaillin and nepetalactone. These pure natural chemicals affect nervous systems of insects, make them die on contact and deter pesky insects. Bio-repellents create an invisible barrier against pests. Mosquitoes are unable to detect their host as they do not feel his sweat and released chemicals. Thus, mosquitoes do not like the fragrance of certain aromatic herbs, such as Citronella, Camphor, Cinnamon, Clove, Lavender, Blue camomile, Lemongrass, Geranium, Catnip, Lemon, Eucalyptus, Vanilla, Cedar wood, Rosemary, Elder, Basil, Tansy, Wormwood, Rue, Garlic, Tomato and Mint. Citronella (or Cymbopogon Nardus) is an Asian grass. Citronella leaves contain active ingredients of citronellol, citronellal and geraniol. These aromatic oils make it impossible for mosquitoes to smell their hosts out. Citronella grass is grown as a renascent border plant in U.S. Department of Agriculture plant hardiness zones 10 through 12 and as an annual in regions with cooler climates. Based on a meta-analysis of studies using the cage method, protection time of the citronella oil for preventing Aedes mosquitoes was less than that in the DEET group, with a difference in protection time of 253 min (95% confidence interval: 169-336). The combination of citronella oil and vanillin is likely to have a longer protection time compared with citronella oil alone. In studies using the room method, citronella oil and/or the combination of citronella oil and vanillin provided complete repellency at least 3 h. In Anopheles and Culex mosquitoes, a combination of citronella oil and vanillin product demonstrated a comparable protection time against DEET; however, it remained inconclusive due to a limited number of studies. Of course, citronella products are less effective than DEET products due to duration of protection. Adding vanillin to citronella oil products prolongs the protection time. How to use citronella oil for homemade candles read here. Cena Geranium is a perennial plant. Homeowners plant them mostly in pots and containers on window sills and in patios. The scent of geranium flowering keeps mosquitoes away from entering your home. Besides, it makes air clean and the surrounding environment healthy in your appartment. 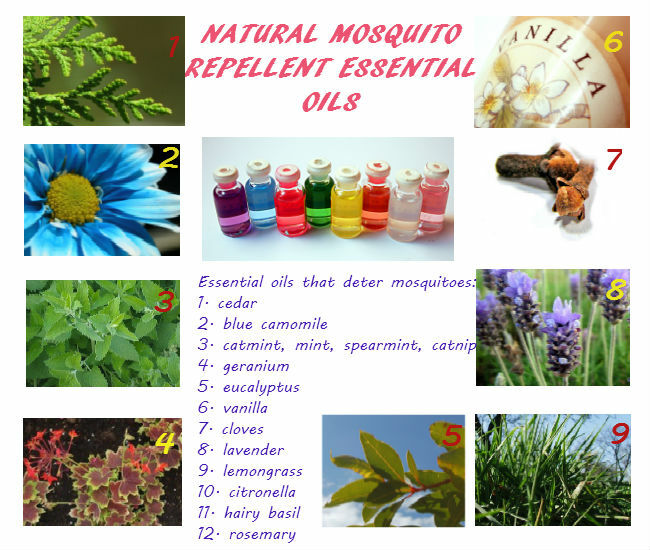 Catmint, Catnip, Peppermint, Spearmint essential oils are used in mosquito repellent blends. Catnip (or Nepeta cataria) is a perennial plant, which contains an active ingredient of nepetalactone. In fact, Catnip oil is reportedly 10 times more effective for mosquito repelling than DEET products. This mint plant is grown in USDA zones 3 through 7. Homeowners use plant-extracted essential oil of lavender for outdoor and indoor pest control. How to use Lavender oil against annoying mosquitoes read here. Basil (or Ocimum americanum) is an annual plant. It contains essential oils that deter mosquitoes naturally. Homeowners and gardeners easily grow this herb in pots or containers near their doorways. Moreover, they plant basil in the garden. In practice, sweet and hairy basil plantations not only prevent mosquitoes from entering your home, but also make the surrounding environment healthy. Besides, you can get some dried lavender flowers, basil and mint leaves and use them in sachet DIY. Put them in a muslin bag or tie them up in a cheesecloth. Then, hang the homemade sachets at home. The scent of clove oil is repellent to most flying insects such as clothes moths, flies and mosquitoes. Moreover, this oil is a home remedy against itchy bites. You may add 20 drops of cloves oil to 2 fl. oz of rubbing alcohol and shake well. Then, drip the solution onto cotton balls and place them on the window sills, headboards, in drawers and wardrobes. For indoor mosquito control, apply this mixture in aroma lamps. This will act as an electric fumigating system. Chrysanthemum (or Dendranthema) is a renascent bedding and border flower. 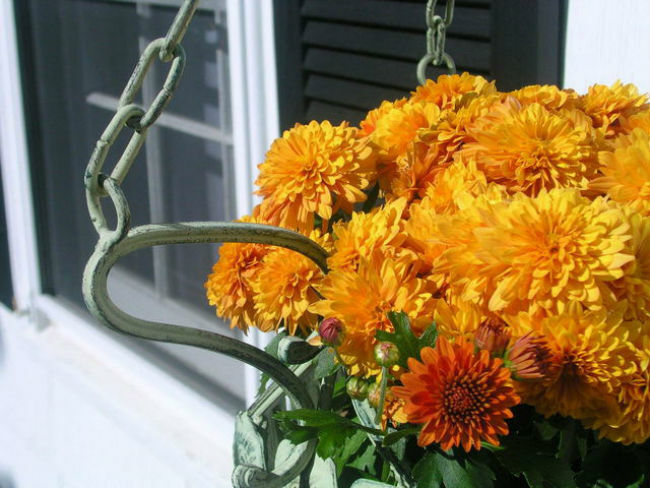 Gardeners grow mums in USDA zones 5 through 10. The flowers of chrysanthemum contain pyrethrin and cinerin. These compounds are highly toxic to insects. Manufactures make a natural insecticide called pyrethrum using esters of chrysanthemumic acid. Liquid for electric misting systems contain this active ingredient as well. Moreover, Persian pyrethrum, Blue camomile and Tansy are effective against mosquitoes as well. Powder from dried bloom, leaves and stems of pyrethrin-containing plants affect insect neurons. Annual bed flowers like Marigold and Ageratum give off a scent that annoys mosquitoes. Lemon eucalyptus is a tree native to Australia. It contains OLE (oil of lemon eucalyptus). This wonderful substance keeps ants, spiders, mosquitoes and flies away. This oil is the most effective among other mosquito repellent oils. In fact, it prolongs the protection against bites for as long as 6 hours. Moreover, its synthetic analogue PMD (p-menthane-3,8-diol) replaces OLE in most commercial anti-mosquito products. Fishing, gardening, hiking, lounging and camping are safe when you treat your clothing and tent with lemon eucalyptus oil. Besides, you may apply pure eucalyptus oil on skin by mixing it with olive oil (1:1), your favorite sunscreen or moisturizing lotion. Biological mosquito control is the best way to keep mosquitoes away from you and your home. As mosquitoes avoid the scent that tomato tops, basil, garlic, geranium, citronella grass, catmint and catnip, lavender, clove, mint, spearmint, lemon grass release, plant thes herbs and flowers in pots and containers at home and in your backyard. Besides, for organic outdoor mosquito control, you can use mosquito yard spray diy with essential oils as well. This natural treatment is safe to pets, plants and kids. Outdoor sprays act as a biological barrier, that deters blood-feeding insects, prevents their bites and control mosquito breeding. Thus, for personal protection, apply homemade topical solutions with essential oils to repel mosquitoes and treat their bites. In addition, to prevent mosquitoes from entering your home, you may use indoor mosquito control methods. Moreover, you may apply a few drops of essential oils on nets, fiber clothes, ribbons and cotton balls. Then, place or hang them near air vents, windows or other openings where insects are likely to enter. Instead, simply fumigate your rooms using aroma lamps with essential oils to repel mosquitoes.